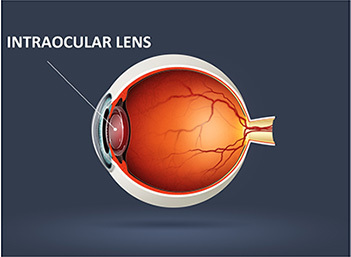 A cataract is clouding or opacity of the focusing lens within your eye. The lens is situated just behind the pupil, in the middle of the eye. In the perfect eye, the lens is clear. As a cataract develops, the lens becomes cloudy or develops opacities, rather like frosted glass. Light rays cannot pass properly through the lens and the vision progressively worsens. A cataract is not a skin growing over the eye, as some people may think..
Blurred vision is one of the main symptoms of cataract.Loss of detail, loss of colour resolution and even reduction of depth of field can all occur. Other people can get symptoms of multiple images in one eye or glare or haloes, particularly at night whilst driving. When does a cataract need surgery? 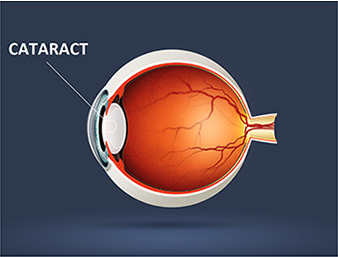 Although a cataract can impair vision, it does not usually, except in rare cases, cause permanent damage to the eyeball. Therefore it is not usually a medical requirement to have an operation. Many people can manage perfectly well in their everyday lives and doing nothing may be the best option for them. Often, unless the cataract is quite dense, stronger glasses can help and it is normal to have seen an optician for an up to date eye test before considering surgery, When your vision is poor enough to prevent you doing the things you like to do or need to do, you may need cataract surgery. If you are having problems with driving, sports or everyday activities, then that is the time to consider surgery. ust as a cataract impairs your sight out on to the world, it also impairs the view that an ophthalmologist has into the eye. Cataract surgery to remove the lens may be recommended by Mr Kheterpal in some cases to enable diagnosis, monitoring and treatment of diseases of the retina or macula at the back of the eye. or macula at the back of the eye. You need to have an operation to have a cataract or your lens removed. The standard operation is removal through a small incision by a process called phacoemulsification and then replacement by an artificial lens within the eye. Corneal astigmatism correction may be carried out at the same time. The commonest way of doing this is with limbal relaxing incisions (LRIs) or with Toric lens implants. The most up to date ultrasound technology is used for lens extraction. We use only the highest calibre lenses from the world’s best manufacturers such as Alcon, Zeiss and AMO. Mr Kheterpal uses an Acrylic single vision injectable lens as standard. Lens types may include single vision (monofocal), astigmatism correcting ( toric) or multifocal lenses. The type of lens chosen is individualised and depends on a number of factors including the health of the eye, lifestyle and preferences. There is no one size or style fits all and each operation choice is carefully considered and personalised.